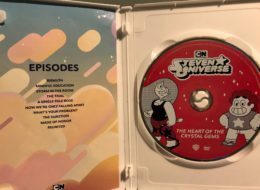 Post Tagged with: "steven universe"
Dylan Hysen, Delaney Stovall, Sam Quattro, & Alex Bonilla recap the January 7th episode of Steven Universe, “Escapism”. Dylan Hysen, Alex Bonilla, & Andy Potter recap the December 31st episode of Steven Universe, “Together Alone”. Justin Cummings, Beatriz Mourad, & John McKenna take your questions and comments about the latest Steven Universe episode, “Familiar”. Justin Cummings, Michelle Anderer, John McKenna, & Andy Potter take your questions and comments on Steven Universe’s “Legs from Here to Homeworld”.